The first software development Scrum was created at Easel Corporation in 1993 based on extensive research on successful projects worldwide, a deep analysis of the computer science literature, close collaboration with leading productivity experts, and decades of experience with advanced software technologies. Jeff Sutherland was the Chief Engineer for the Object Studio team that defined roles, hired the first Product Owner and ScrumMaster, developed the first Product Backlog and Sprint Backlog and built the first portfolio of products created with Scrum. They built the first object-oriented design and analysis tool that incorporated round-trip engineering in the initial SCRUM. A second SCRUM implemented the first product to completely automate object-relational mapping in an enterprise development environment. Jeff was assisted by two world-class developers, Jeff McKenna, now an extreme programming (XP) consultant, and John Scumniotales, now a development leader for object-oriented design tools at Rational Corporation. There were some key factors that influenced the introduction of SCRUM at Easel Corporation. The book “Wicked Problems, Righteous Solutions” (DeGrace and Stahl 1990) reviewed the reasons why the waterfall approach to software development does not work for software development today. Requirements are not fully understood before the project begins. The user knows what they want only after they see an initial version of the software. Requirements change during the software construction process. And new tools and technologies make implementation strategies unpredictable. DeGrace and Stahl reviewed “All-at-Once” models of software development which uniquely fit object oriented implementation of software. In 1995, Jeff introduced the Scrum team to Ken Schwaber, CEO of Advanced Development Methods. Ken agreed that Scrum was a better way to build software and they worked together to formalize the Scrum development process at OOPSLA’95 . In the same year, Sutherland provided support for development of eXtreme Programming by giving Kent Beck all background information on the creation of Scrum and the results of two years of product development with the Scrum process from 1993-95. XP engineering practices evolved along with Scrum and the two leading Agile development processes work well together. Scrum and XP are the most widely used Agile processes worldwide and their creators are signatories of the Agile Manifesto. Jeff Sutherland got the name “Scrum” from the famous article “The New New Product Development Game,” which was published by Takeuchi and Nonaka in the Harvard Business Review in 1986. This article describes how companies like Honda, Cannon, Fuji-Xerox produced world class results using a scalable, team based approach to all at once product development. It also emphasizes the importance of empowered self organizing teams and outlines managements role in the development process. in Japan and the United States are using a holistic method – as in rugby, the ball gets passed within the team as it moves as a unit up the ﬁeld. Evolution occurs in dynamic response to environmental demands. In a Type A Scrum, all development occurs in an increment within the time box of Scrum iteration called a Sprint. A side effect of this approach is downtime between iterations when reorganizing for the next Sprint. Nevertheless, well executed Sprints can double productivity and repeatedly deliver projects on time, within budget, with functionality precisely targeted to end-user demands. By adding product definition tasks for the next Sprint into the current Sprint, a Type B Sprint allows work to flow smoothly from Sprint to Sprint. Product backlog requirements for the next Sprint are developed in the current Sprint. This has enabled some development organizations to deliver more working product than sales, marketing, or customers can absorb. The development bottleneck is eliminated and the company can adopt new strategies and create new products that were previously impossible to deliver. Type C Sprint can be envisioned as overlapping Sprints by running software releases through the same Scrum team at the same time. This requires experienced Scrum teams, well designed product architecture, and automation of Product and Sprint backlogs. Throughput can be enhanced to deliver dozens of new releases of enterprise software annually. Competitors can be overwhelmed and market dominance achieved. To deal with simultaneous weekly and monthly Sprints, along with quarterly major releases, a MetaScrum was formed at PatientKeeper led by the lead Product Owner. This is a weekly meeting that typical takes 1.5 hours and includes the CEO and other senior management, as well as leadership from marketing, development, quality assurance, installation, and support. Takeuchi and Nonaka observed that collapsing phases of product development improved innovation, throughput, time to market, and product acceptance. As market pressures have evolved and changed, it is possible to collapse Scrum Sprints to create a dramatic increase in business opportunity. Sutherland and Schwaber evolved Scrum through trial and error at a number of companies during the s – NewsPage, IDX Systems, Fidelity Investments, and PatientKeeper. The Daily Scrum, the burndowns and the Sprint Backlog were added, and planning Sprints were dropped. !e importance of self-managing, cross functional teams became apparent and a bedrock to Scrum. In Schwaber’s mind, Scrum and Agile started emerging for two reasons: The Agile Manifesto was a rallying point for dissatisfaction and a new approach. The emergence of new IDEs that were as powerful as SmallTalk, like VisualStudio and Eclipse, were the technological enablers. Scrum has streamlined software development — and professionals from around the world are starting to see the value of using Scrum. Of all the possible Agile frameworks used by companies, 66 percent are Scrum or Scrum variants. Scrum has the power to transform project management across every industry, every business, and even across life in general. By using Scrum, teams become more Agile, discovering how to react more quickly and respond more accurately to the inevitable change that comes in the teams way. And by staying focused, collaborating, and communicating, you can accomplish what truly needs to be done — successfully. Most important, Scrum is not unproven hype. It’s a solid and successful Agile framework that’s been applied to a variety of projects and teams. Universities use Scrum to deliver valued projects to clients. Militaries have relied on Scrum to prepare ships for deployment. In the automotive world, Team Wikispeed is using Scrum to build a fast, affordable, ultra-efficient, safe commuter car that should sell for less than $20,000. 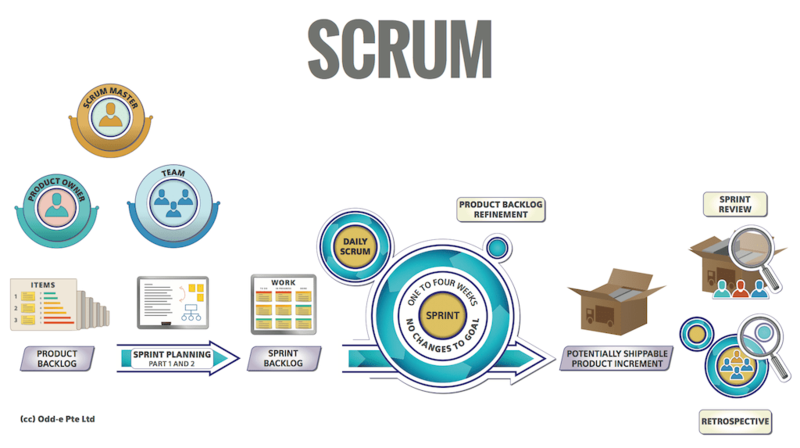 So whether you’re working on the next smartphone app, managing logistics for a store, or planning a charity event, you should take a closer look at using Scrum. And Scrum Alliance can give you the proven framework, best implementation practices, and supportive guidance you need to achieve success. The most profitable software product ever created (Google Adwords ) is powered by Scrum and the most productive large project with over a million lines of code (SirsiDynix and Starsoft) used a distributed, outsourced, Scrum implementation. CMMI Level 5 companies cut costs in half with Scrum while simultaneously improving quality, customer satisfaction, and the developer experience (Systematic Software Engineering). At the same time, Scrum remains the process of choice in small entrepreneurial companies where it has it roots. Scrum is founded on empirical process control theory, or empiricism. Empiricism asserts that knowledge comes from experience and making decisions based on what is known. Scrum employs an iterative, incremental approach to optimize predictability and control risk. Three pillars uphold every implementation of empirical process control: transparency, inspection, and adaptation. Significant aspects of the process must be visible to those responsible for the outcome. Transparency requires those aspects be defined by a common standard so observers share a common understanding of what is being seen. Scrum users must frequently inspect Scrum artifacts and progress toward a Sprint Goal to detect undesirable variances. Their inspection should not be so frequent that inspection gets in the way of the work. Inspections are most beneficial when diligently performed by skilled inspectors at the point of work. If an inspector determines that one or more aspects of a process deviate outside acceptable limits, and that the resulting product will be unacceptable, the process or the material being processed must be adjusted. An adjustment must be made as soon as possible to minimize further deviation. Scrum is the best known of the Agile frameworks. It is the source of much of the thinking behind the values and principles of the Agile Manifesto, which forms a common basis for all of these approaches. Individuals and interactions over processes and tools. Scrum, like all the Agile frameworks and methods, relies directly on trust in teams, the individuals in the teams, and the way they interact. Teams figure out what is to be done, teams figure out how to do it, and teams do it. Teams identify what’s getting in their way, and they take the responsibility to resolve all the difficulties that are within their scope. Teams work with other parts of the organization to resolve the concerns that are outside their control. This is critical. Trying to do Scrum but undermining this primary focus on team responsibility and autonomy will generally lead to trouble. Working software over comprehensive documentation. Scrum requires a working, finished increment of the product as the primary result of every sprint. Certainly there will be analysis work, design work, and testing work, all of which may need to be documented. But it is having a result (working software) that allows the organization to guide the project to success. This is critical. Scrum teams must produce a product increment in every sprint. Customer collaboration over contract negotiation. The Scrum product owner is the Scrum team’s prime point of contact with the eventual end users of the product. The product owner is a member of the team and works collaboratively with the team to determine what needs to be done. In this collaboration, the product owner selects the most valuable next things to do, ensuring that the product has the highest possible value at every point in time. This is critical. The product owner needs to build a rich collaboration with the team. Responding to change over following a plan. Everything about Scrum is designed to make sure that everyone has the information they need to make good decisions about the project. The project’s progress is represented by a real, running product increment. The backlog of things to be done is available for all to see. Progress, both overall and sprint by sprint, is clearly visible. Problems and concerns are discussed openly and dealt with immediately. This is critical. Scrum works well for teams that openly inspect what’s going on and adapt their actions to the reality. It works poorly for those who do not. Focus. Because we focus on only a few things at a time, we work well together and produce excellent work. We deliver valuable items sooner. Courage. Because we are not alone, we feel supported and have more resources at our disposal. This gives us the courage to undertake greater challenges. Openness. As we work together, we practice expressing how we’re doing and what’s in our way. We learn that it is good to express concerns so that they can be addressed. Commitment. Because we have great control over our own destiny, we become more committed to success. Respect. As we work together, sharing successes and failures, we come to respect each other and to help each other become worthy of respect. If an organization will let Scrum do its work, everyone involved will discover the benefits and will begin to understand why Scrum both engenders and relies upon these values. Scrum is a framework for building a product. Scrum is also a team process that begins when stakeholders need a product. The Scrum team includes three roles: the product owner, the ScrumMaster, and the members of the development team. These roles are further described below. The product is built incrementally over a series of short time periods called sprints. A sprint is a fixed time period, up to four weeks long but with a preference toward shorter intervals. During each sprint, the Scrum team builds and delivers a product increment. Each increment is a recognizable, visibly improved, operating subset of the product, meeting understood acceptance criteria and built to a level of quality referred to as the Definition of Done. Scrum includes three essential artifacts: the product backlog, the sprint backlog, and the product increment. The product backlog is the list of ideas for the product, in the order we expect to build them. The sprint backlog is the detailed plan for development during the next sprint. The product increment, a required result of every sprint, is an integrated version of the product, kept at high enough quality to be shippable if the product owner chooses to ship it. In addition, Scrum requires transparency within the team and with the stakeholders. Therefore the Scrum team produces visible displays of plans and progress. Scrum also includes five activities or meetings. These are the backlog refinement, sprint planning, daily scrum, sprint review, and sprint retrospective. SCRUM project planning uses lightweight techniques such as Burndown Charts, as opposed to PERT charts. A PERT chart is only as good as the assumptions inherent in the critical path represented on the chart. In agile development, the critical path usually changes daily, rendering any given PERT chart obsolete within 24 hours. The solution is using a technique to calculate the velocity of development. The neural networks in the brains of team members are used on a daily basis to calculate the critical path. This allows the plan to be recalculated and the velocity of “burndown” of work to be computed. Team efforts to accelerate or decelerate the velocity of burndown allow a team to “fly” the project into a fixed delivery date. SCRUM is the only agile methodology that has been formalized and published as an organizational pattern for software development (Beedle, Devos et al. 1999). The process assumes that requirements will change during the period between initial specification and delivery of a product. It supports Humphrey’s Requirements Uncertainty Principle which states that for a new software system, the requirements will not be completely known until after the users have used it. SCRUM allows for Ziv’s Uncertainty Principle in software engineering – uncertainty is inherent and inevitable in software development processes and products (Ziv and Richardson 1997). And it support Wegner’s Lemma which states that it is not possible to completely specify an interactive system (Wegner 1995). Most software systems built today are object-oriented implementations which depend on environmental inputs to determine process outputs, i.e. interactive systems. The product owner has responsibility for deciding what work will be done. This is the single individual who is responsible for bringing forward the most valuable product possible by the desired date. The product owner does this by managing the flow of work to the team, selecting and refining items from the product backlog. The product owner maintains the product backlog and ensures that everyone knows what is on it and what the priorities are. The product owner may be supported by other individuals but must be a single person. Certainly the product owner is not solely responsible for everything. The entire Scrum team is responsible for being as productive as possible, for improving its practices, for asking the right questions, for helping the product owner. Nonetheless, the product owner, in Scrum, is in a unique position. The product owner is typically the individual closest to the “business side” of the project. The product owner is charged by the organization to “get this product out” and is the person who is expected to do the best possible job of satisfying all the stakeholders. The product owner does this by managing the product backlog and by ensuring that the backlog, and progress against it, is kept visible. The product owner, by choosing what the development team should do next and what to defer, makes the scope-versus-schedule decisions that should lead to the best possible product. The development team is made up of the professionals who do the work of delivering the product increment. Scrum requires that the development team be a cross-functional group of people who, as a group, have all the necessary skills to deliver each increment of the product. The development team members are expected to be available to the project full time, not splitting their time over numerous projects. They have the responsibility of self-organizing to accomplish each sprint goal, producing each new product increment according to each sprint plan. The product owner makes an ordered list of what needs to be done; the development team members forecast how much they can do in one sprint, and they decide how they are going to do it. The ScrumMaster is a “servant leader” who helps the rest of the Scrum team follow the process. The ScrumMaster must have a good understanding of the Scrum framework and the ability to train others in its subtleties. The ScrumMaster helps the product owner understand how to create and maintain the product backlog. He or she works with the entire Scrum team to evolve the Definition of Done. The ScrumMaster also works with the development team to find and implement the technical practices needed to get to Done at the end of each sprint. Another responsibility of the ScrumMaster is to remove impediments to the team’s progress. These impediments may be external to the team (such as a lack of support from another team) or internal (such as the product owner not knowing how to properly prepare the product backlog). That said, the ScrumMaster fosters self-organization, meaning that the team itself should remove issues wherever possible. The ScrumMaster may facilitate meetings and always acts as a coach for the Scrum team, helping it execute the Scrum process. He or she helps team members work together and learn the Scrum framework, and protects them from both internal and external distractions. The ScrumMaster keeps the Scrum team on track, productive, and growing in ability. Ultimately, the ScrumMaster is responsible for ensuring that Scrum is understood and in place, inside the team and outside. He or she helps people outside the team understand the process and the kinds of interactions with the team that are helpful (and those that are not). The ScrumMaster helps everyone improve to make the Scrum team more productive and valuable. The product backlog is crucial tool that enables the scrum team to achieve fast, flexible, value delivery flow in the presence of uncertainty. The product backlog is an essential artifact in Scrum. It is an ordered list of ideas for the product, kept in the order in which the team expects to do them. It is the single source from which all requirements flow. This means that all the work the development team does comes from the product backlog. Every feature idea, enhancement, bug fix, documentation requirement — every bit of work the team does — is derived from a product backlog item. Each item on the product backlog includes a description and an estimate of the team capacity required to produce it. The product backlog may begin as a large list or a short one. It may be vague or detailed. Typically, it begins short and vague and becomes longer and more concrete as time goes on. Product backlog items slated for implementation soon will be clarified, better defined, and split into smaller chunks as part of the product backlog refinement activity. The Product Owner is accountable for maintaining the product backlog, although he or she may — and should — have help in producing it and keeping it up to date. Individual product backlog items may originate from the Product Owner, from team members, or from other stakeholders. Depending on the nature of the product, other skills and inputs may be necessary. In every case, product backlog refinement is best considered as an activity for all team members, not just for the Product Owner. Each sprint begins with a time-boxed meeting called the sprint planning meeting. In this meeting the Scrum team collaborates to select and understand the work to be done in the upcoming sprint. The entire team attends the sprint planning meeting. Working from the ordered product backlog, the Product Owner and the development team members discuss each item and come to a shared understanding of that item and what is required to complete it according to the current Definition of Done. All Scrum meetings are time-boxed. The recommended time for the sprint planning meeting is two hours or less per week of sprint duration. Because the meeting is time-boxed, the success of the sprint planning meeting is highly dependent upon the quality of the product backlog going in. This is why product backlog refinement is an important Scrum activity. Scrum moves control from a central scheduling dispatching authority to individual teams doing the work. In the first part of the meeting, the Product Owner presents ordered product backlog items to the development team, and the whole Scrum team collaborates to understand the work. The number of product backlog items to undertake in the sprint is solely up to the development team. To decide how many items to undertake, the development team considers the current state of the product increment, the past performance of the team, the team’s current capacity, and the ordered product backlog. The development team alone decides how much work to take on. Neither the Product Owner nor any other agency can push more work onto the development team. Often, but not always, the sprint has a goal. Having a sprint goal is a strong practice that helps everyone focus more on the essence of what needs to be done and less on small details that may not truly be important for the final product. In the second part of the meeting, the development team collaborates to decide how to produce the next product increment in accordance with the current Definition of Done. The team does sufficient design and planning to be confident of completing the work during the sprint. Work to be done in the early days is broken down into small units of one day or less. Work to be done later may be left in larger units to be decomposed later. Deciding how to do the work is the responsibility of the development team, just as deciding what to do is the responsibility of the Product Owner. The Product Owner needs to be readily available to the team even if he or she does not attend this part of the meeting. However, the Product Owner may remain to answer questions and resolve misunderstandings. Sprint planning concludes with the Scrum team reaching a common understanding of the quantity and complexity of what is to be accomplished during the sprint and with a rational expectation of being able to complete it. The development team forecasts the amount of work it will complete and commits to accomplishing it. The resulting list of things to do is the sprint backlog. The sprint backlog is the list of refined product backlog items chosen for development in the current sprint, together with the team’s plan for accomplishing that work. It reflects the team’s forecast of what work can be completed. With the sprint backlog in place, the sprint begins, and the development team develops the new product increment defined by the sprint backlog. During the sprint, the development team self-organizes to produce the defined product increment. Self-organizing means that the development team determines how to produce and then does produce the product increment, in accordance with organizational standards, according to the Definition of Done. The most important Scrum artifact is the product increment. Every sprint produces a product increment that must be of high enough quality to be given to users. The product increment must meet the Scrum team’s current Definition of Done, and each component of it must be acceptable to the Product Owner. Scrum requires transparency within the team and outside the team. While the product increment is the most important way of creating transparency, the Scrum team will create any other artifacts that are needed to make sure that the status of the project is understood. Such artifacts commonly include burn charts and task boards. When the product increment is delivered, it needs to be “done” according to a shared understanding of what “done” means. This definition is different for every Scrum team, and as the team matures the Definition of Done will expand and become more stringent. The Definition of Done must always include the notion that the product increment be of high enough quality to be shippable: The Product Owner could choose to release it immediately. The product increment includes the functionality of all previous product increments and is fully tested so that all completed product backlog items continue to work together. There may be brief, clarifying questions and answers, but there is no discussion of any of these topics during the daily Scrum itself. However, many teams meet right after the daily Scrum to work on any issues that have come up. The daily Scrum is not a report to management, nor to the Product Owner, nor to the ScrumMaster. It is a communication meeting within the development team that ensures that team members are all on the same page. Only the Scrum team members, including ScrumMaster and Product Owner, speak during this meeting (although other interested parties may come and listen). Based on what comes up in the meeting, the development team reorganizes the work as needed to accomplish the sprint goal. The daily Scrum is a key element of Scrum, leading to transparency, trust, and better performance. It provides rapid recognition of problems and builds the team’s self-organization and self-reliance. All Scrum meetings are timeboxed; the recommended timebox for the daily Scrum is no more than 15 minutes. At the end of the sprint, the Scrum team and stakeholders review the sprint’s output. The recommended timebox for the sprint review is one hour per week of sprint duration. The central point of discussion is the product increment completed during the sprint. It is generally both wise and helpful for the stakeholders to attend this meeting, since they are directly interested in the product. This is an informal meeting to look at where the team is and to collaborate on how it might go forward. Everyone has input at the sprint review. Naturally, the Product Owner makes the final decisions about what happens next, updating the product backlog as appropriate. Every teams will find its own way to handle the sprint review. A demonstration of the product increment is a common procedure. Groups also often discuss what they observed during the sprint and what product ideas came to mind. They discuss the state of the product backlog and talk about possible completion dates and what might be achieved by those dates. The sprint review gives everyone present an overview of the current product increment; therefore, it is common to update the product backlog as part of the sprint review. The Scrum team improves its own process, always remaining within the Scrum framework. Therefore, at the end of each sprint, the Scrum team meets for the sprint retrospective. The purpose is to review how things went in terms of the process, relationships among people, and the tools. The team identifies what went well and what didn’t go so well, and it identifies potential improvements. The recommended timebox for the sprint retrospective is one hour per week of sprint duration. This Scrum cycle repeats for every sprint. To sum up, the Scrum team’s members (the Product Owner, the development team, and the ScrumMaster) collaborate to create a series of product increments during short, time-boxed intervals called sprints. Each increment meets the Product Owner’s acceptance criteria and the team’s shared Definition of Done. The team works from a product backlog. During each sprint, the team begins with sprint planning to produce the sprint backlog, which is a plan for the sprint. The team self-organizes to handle the development, using daily Scrum meetings to coordinate and to ensure that they are producing the best possible product increment. The team performs product backlog refinement to prepare for the next sprint’s planning meeting. It ends the sprint with the sprint review and sprint retrospective, reviewing the product and the process. “Scrum and Agile are similar to Lean Thinking. Scrum is a new way of doing business, but there won’t be that many that reap all of its beneﬁts – such as productivity, quality, engaged people, and maximized return on investment. American automobile companies were immersed in running their operations top-down, using the principles of Scientiﬁc Management to try to plan everything. “John Chambers, the CEO of Cisco, put his organization through such a change over the last four years and commented that it was the hardest thing he had ever done. In February and March of 2013, Scrum Alliance, ProjectManagement.com and ProjectsAtWork surveyed their readership on use, knowledge and views of Scrum. The extensive survey of nearly 500 participants included in-depth interviews and a literature review. Participants from more than 70 countries responded to the survey, with the United States leading at 35% and India second at 12%. The United Kingdom,Canada and Australia accounted for 4% each, with Germany at 3% and South Korea, Mexico,Belgium, Brazil, Malaysia and New Zealand comprising 2%. The majority of the participants are from the IT industry (41%),but a good representation camefrom Finance (12%), Government(6%), Healthcare (6%) and Telecommunications (5%), indicating the growing interest in Scrum outside IT. 53% of the participants were from organizations with 1,000 or fewer employees, yet 44% were with companies with annual revenues of $50M to $1B+. 28% were from organizations with ISO 9001 certification, but nearly half (48%) did not have any. • While 41% of organizations are jumping into Agile waters without requiring a specific certification of their employees, 54% either agree or strongly agree that a certification such as the Certified Scrum Professional (CSP) improves their chances of sustained success. • Culture is king in the Agile world—and according to a majority of respondents, organizations must create cultures that encourage collaboration in order to deliver value to their customers. This includes fostering self-organized teams and active support from management. Scrum facilitates all of these success factors. • Scrum is the overwhelmingly preferred Agile method, used by 40% of respondents.The second-most popular method is Kanban, often using many elements of Scrum,a noteworthy trend as organizations seek to find for themselves what works for their specific domains and needs. majority (38%) of which are in R&D, operations or production. • 60% of the survey participants used Scrum regularly. 39% used Scrum more broadly throughout their business as one of their project management practices, while 16% used it exclusively for software development projects. 46% of the participants are deploying and managing Scrum projects within a Project Management Office (PMO), and 24% feel that managing and deploying Scrum projects this way is effective and successful. • In terms of business priorities for Scrum projects, 41% feel that fulfilling customer needs is highest, while meeting budget, time and scope constraints as well as engaging in projects that drive innovation and market share followed with 36%. In terms of providing customer satisfaction while using Scrum, 27% feel having active senior management support is vital, and 22% say a clear set of business goals for what gets achieved is necessary. That is why over half felt that cultural influences such as an open and collaborative environment—and empowered/self-organizing Scrum teams—are vital for facilitating Scrum; that can only be achieved through active support of management and clear business vision. • The common belief that the vast majority of organizations adopting and integrating Scrum come from a Waterfall-like background was supported by the survey. 24% use Scrum for some projects while using Waterfall for the rest. 13% use Scrum exclusively, while 31% indicate no use of Waterfall. 23% felt it was a difficult transition from a Waterfall-based method to Scrum. Another perception, stated by 25% of respondents, was that there were no clearly identified metrics to identify and measure the successful delivery of Scrum projects. Scrum will continue to grow because it is poised for the “Age of the Customer.”What lies at the heart of Agile is the obsessive focus on service to the customer—the mainstay of almost any business. Another recent and famous example of Scrum outside of software development is embodied in a sports car called Wikispeed. Built by Joe Justice, a software engineer by trade, and a team who entered the 2008 X-Prize competition, Wikispeed was deployed using Scrum and crowdsourcing. The team was able to place tenth in a crowded and highly competitive environment. This was done by getting a working prototype in three months for a car that can go from 0 to 60 mph in less than five seconds, weighs just 1,404 pounds, has a top speed of 149 mph and gets more than 100 mpg—all using Agile practices and techniques. Scrum is well suited for complex problems, where routine cookie cutter solutions does not apply. In complex domains the ability to probe, explore, sense,inspect, adapt,and respond is critical.